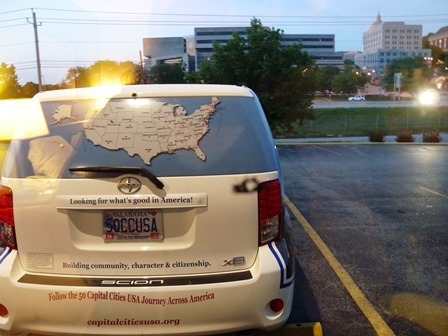 Linda Burton posting from Jefferson City, Missouri – “I took the road less traveled by,” is a line from one of my favorite Frost poems; it came to mind today as I made my way to my next stop. 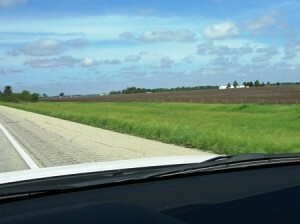 I was on the freeway from Springfield to the Missouri state line, but I-72 qualifies as a road less traveled; traffic was light as I headed west through Illinois farmland; flat land, rich and dark and ready for the spring planting; or maybe that has already happened and the seeds are in there, waiting to pop up. Side-of-the-road grasses were already thick and bugs were already waiting; the wipers couldn’t stay ahead of the windshield splats. I watched the sky; sometimes blue, sometimes gray; hopefully the line of storms predicted to come through in late afternoon would stay to the south. All over the country minds were reeling from the events in Oklahoma last night; an F-5 tornado cut a mile-wide swath through the town of Moore, wiping out two schools and killing children; destruction was incomprehensible. Moore is just south of Oklahoma City where cousin Jayne lives; I remembered seeing signs from the freeway when I was there. 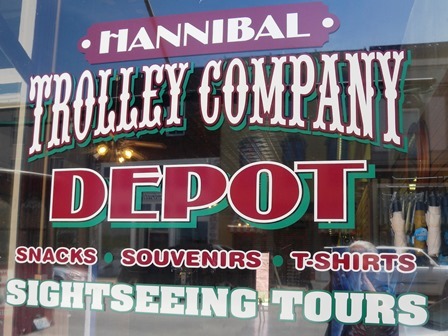 My plan today was to get from Springfield to Jefferson City during the lull between storms, with a quick stop in Hannibal. I began to notice something amiss as I approached the Mississippi River, giant oaks with trunks twisted and flung to the ground; patches of trees with limbs ripped away. 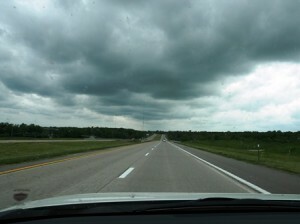 Something wicked this way has come, I thought, as I crossed the long bridge that took me into Missouri. 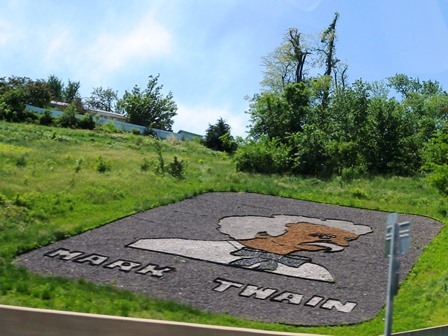 The road curved up between limestone cliffs; on the hillside to my left the face of Mark Twain welcomed me to Hannibal. Martin, who was manning the Welcome Center, told me what happened last night; a small tornado, nothing like what hit Oklahoma, but terrifying nonetheless. 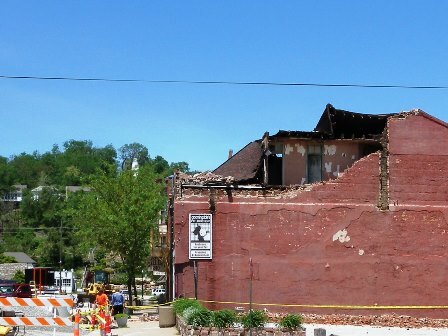 “We headed for our basement,” he told me, “and my wife said a prayer that our oak tree wouldn’t fall on our house. We crouched down there for twenty minutes or so and when the noise ended we crept back upstairs and peeped out the door. 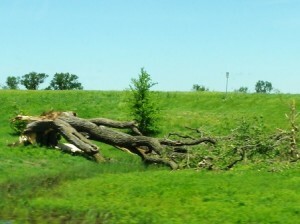 Our oak tree was still standing. Next door, an oak tree had fallen across our neighbor’s house.” He advised against going downtown, the power was out and some streets were blocked. “I don’t expect power at my house before Thursday,” he said. He handed me maps and brochures about Missouri and wished me a safe trip. I headed downtown anyway, prepared for detours and delays; parked beside the Hannibal Depot where the Trolley sat. People were walking around last night’s damage; a giant tree lay on the ground beside umbrella tables; its falling limbs had crumbled part of a building beside. Another building lost part of its upper structure; bricks were strewed in the parking lot below; the street out front was blocked. But life goes on; a few stores were open for business, ready for the summer crowds. It was too warm to leave the cats in the car for more than a minute; too many miles yet to go before more storms might arrive. Detours and trash-hauling trucks confused the GPS, and me; I couldn’t find the whitewashed fence of memory (that summer day in 1977 when my boys stood laughing out front, as cute as Tom and Huck ever were). 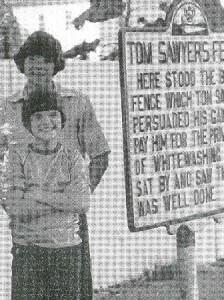 Now my boys are men and now I travel with my cats, but that day remains, somewhere in time, and faded photographs. Jack Cat put his paws on the seatback and peered out the window as I stopped to gas up at the edge of town. 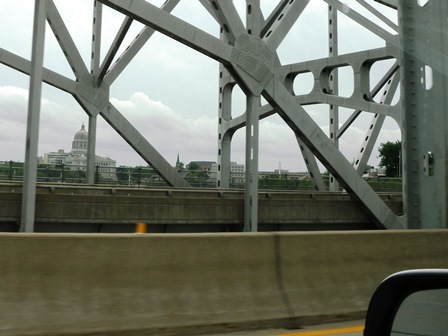 The last hundred miles were a series of highway changes and turns; there is no other way to get to Jefferson City. 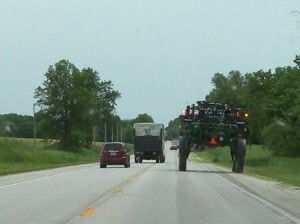 Take Highway US 61 south for ten miles; turn right onto SR 19 (don’t go to New London). Then two-lanes, and farm machinery on the road; a tractor unlike anything I’ve seen before; skinny tires but high off the ground with a wide space open underneath. To drive over rows of corn? I’d have to find out. The Mark Twain Birthplace State Historic Site to the west, Vandalia to the east. Turn right again, west on US 54 to Mexico, and the American Saddle Horse Museum (don’t stop); and now the road turned south, four-lanes again. A Walmart truck ahead; a dizzy busy intersection at the cross over I-70, on the last leg for today. Overhead, the clouds had thickened; I passed by Fulton, site of the Churchill Memorial (I’ll have to find out about that). I made it in time; as I crossed the Missouri River Bridge I spotted the capitol dome, high on the hill above the city. 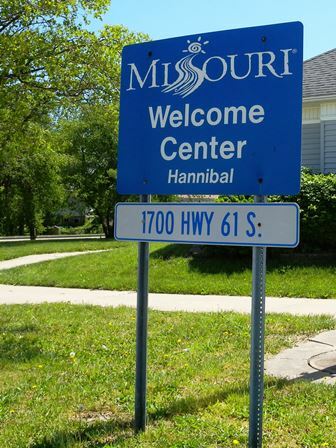 Jefferson City, Missouri, population 43,079; a small town off the beaten path yet only 100 miles north of the population center of the United States (Plato, Missouri, US 2010 Census). Cozied in my hotel room tonight at not quite dark, I could see the capitol dome through the reflection of the lamplight on my window, just beyond the Truman State Office Building on the hill. The cats were curled on either end of the sofa, crowding me out. I propped myself against the bed pillows, opened a brochure I’d picked up at the Welcome Center today, and began to read. Write your own story. Whether you are looking for relaxation, adventure, history, the great outdoors or family fun….there is something magical about getting in the car and taking off to experience life firsthand….take a major highway or a road less traveled. Why wait? Robert Frost and Mark Twain and that Missouri PR person had the right idea. I do, too.